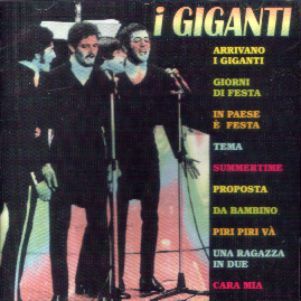 Many prog fans from outside Italy probably only know I Giganti for their much looked-after Terra in bocca album, but this band from Milan was formed in 1964 with the same line-up and was one of the most successful beat groups in Italy during the sixties, with two albums and around 15 singles before a short split. They even played with the Beatles during one of their Italian dates. All the members were also good singers and the nice contrast between their different voices (including the characteristic bass tone of drummer Enrico Maria Papes) was one of the most impressive elements in their 60's production. Terra in bocca is a very ambitious concept album about mafia, with strong and brave lyrics (written by Piero De Rossi) and complex music arrangements, that sometimes are not perfectly combined with text. All the tracks are connected to form two side-long suites. For its contents the album was also banned by the Italian radio. Some guests appear on it, among which the keyboardist and composer Vince Tempera (who later played with Il Volo) future Area's bass player Ares Tavolazzi, drummer Ellade Bandini (these three musicians were playing together at the time under the name The Pleasure Machine), guitarist Marcello Dellacasa, later with Latte e Miele and the spanish bass player of I Ribelli, Angel Salvador. An interesting work though a bit disjointed, very hard to follow for non Italian listeners, the album is rare and well regarded by many. A single was also taken from the LP, having the same cover picture (designed by Gianni Sassi and his al.sa studio before he founded the Cramps label), and the band released another 7" single a year later before disbanding. Keyboardist Marsella was involved in the only album by Track in 1974, along with members of Nuova Idea and Jumbo. Guitarist Mino Di Martino was briefly involved in Telaio Magnetico, then formed the avantgarde group Albergo Intergalattico Spaziale in late 70's, releasing a rare album in 1978, and has collaborated with Franco Battiato and Claudio Rocchi. Bassist Sergio Di Martino died in 1996. Two of the original members have played many times under the name Giganti in the latest years. 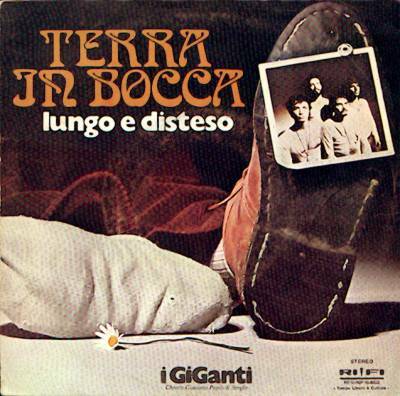 The LP Terra in bocca, one of the early examples of an Italian rock opera, sadly censored by an incomprehensible ban at the time, is the subject of a brilliant essay written by Brunetto Salvarani and Odoardo Semellini (in Italian only), issued in 2009 and containing a CD with the original album and a bonus track. Rare to find in its original issue (especially with the poster) on RiFi, Terra in bocca was reissued by Akarma on vinyl in 2000 with a bonus track from their last single from 1972. The unusual cover (with a picture by Ugo Colombo) and poster were designed by Gianni Sassi and remind the style of his later works with Cramps, being quite probably the first to feature a Polaroid photo that became Sassi's trademark. The album was released in a limited number of copies (presumably between 3000 and 5000) and never reissued by RiFi due to the lack of success. The original poster was black and white, while the one included in the Akarma reissue is easily identified for the greenish tint and smaller size. 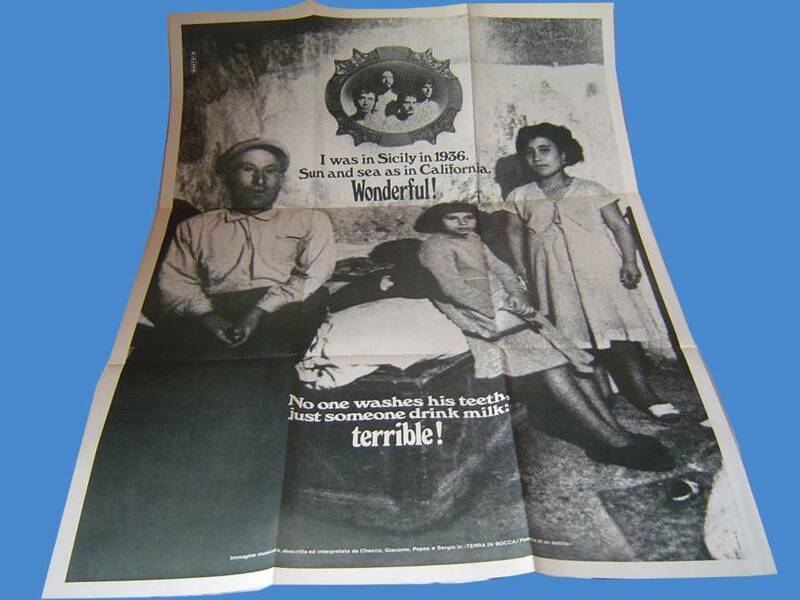 Some of the original copies sold with the poster also had a small purple round sticker on front cover with the words "contiene il manifesto più squallido dell'anno" ["contains the dingiest poster of the year"]. 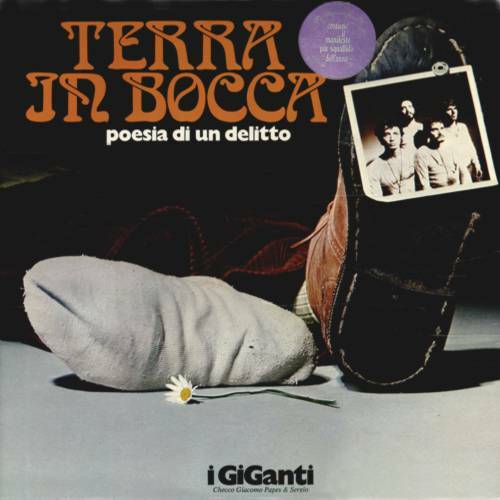 The Vinyl Magic CD issue of Terra in bocca exists in two different forms, the first one was released in 1989 (and reissued in 1997 and 2000) and is curiously different from the original LP, probably coming from a demo tape. The total length of the album is 44:09 minutes, and opposed to the final version this sounds less rich and orchestrated but more intense at times. This first reissue also included a miniature reproduction of the original poster. A second issue from 1993 (almost identical to the first in the CD cover, though with a different disc label), has a 46:44 minutes length and is presumably taken from the original masters. This doesn't include the mini-poster. 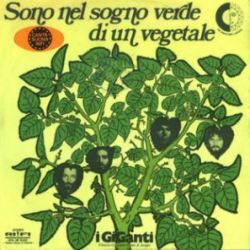 The Akarma reissue from 2000, with mini-LP gatefold cover, includes a bonus track, Sogno di un vegetale, different from the song with similar title issued on single in 1972. Akarma also released in 2009 the CD, having the same number as the previous one, sold with the nice Terra in bocca book by Brunetto Salvarani and Odoardo Semellini. This CD contains an unreleased bonus track, ll pescatore, the original version of Lungo e disteso, sung and played by the composer Piero De Rossi. A Korean issue exists on Si-Wan (SRML 2014), with gatefold cover. The album has never been counterfeited. Thanks to Alessio, Ivan Scarcelli and Danilo Cortellazzi for pictures and info, to Paolo D'Ambra for details on the cover picture, to Brunetto Salvarani and Odoardo Semellini for some details taken from their book.